Z Code Mystery - Possible Explanation? I have examined all 5 Olds A body (documented by GM of Canada) vehicle paperwork that I have, Specifically the built codes. A. All 1970 to 1971(April ?? )Canadian imported "Lansing" cars had a Z in the Fisher trim tag, but no Z49. But did have the V48 "increased engine coolant protectant" option. B. All (April ?? 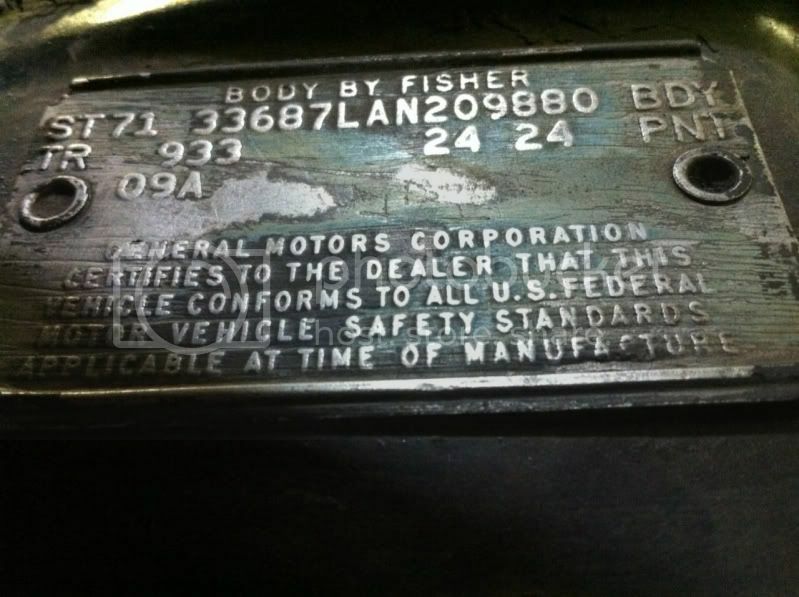 )1971 to 1972 Canadian imported "Lansing" cars had no Z in the Fisher trim tag and no V48. But had Z49 "mandatory canadian base equipment. Therefore, it seems that in April(?) 1971 the "mandatory canadian base equipment" code was changed from Z to Z49. 1. The change was possibly due to a change in Canadian import regulations. 2. As noted on previous threads, some U.S. vehicles may have the Z and/or Z49 because they were destined for export but were exchanged by dealers or the factory. Please check your applicable built codes & let's get this solved! My Lansing-built/Canadian-sold '71 was built the end of May and agrees with statement 'B' above. You may be on to something. Since the broadcast card denotes the Z next to the trim code box, and that box is bracketed on the top with that red sideways parenthesis "border" to the SPCL box, it would make sense it has to be somehow tied to what the trim code denotes. I think you misunderstand what I am saying. I'm not saying the Z means Z49 and the search is over. I mean that I think there is a connection. I believe that the Z on the Broadcast Cards is indeed the same Z that is on the data tags. Not absolute, but I think a safe assumption at this point. But the Z on the broadcast card does not mean that there is *just* something in the interior involved with the Z. But is does imply that the interior *is involved* in whatever the reason is for the Z.
Hypothetically, if special seat belts were needed to comply with Canadian requirements, this all would make perfect sense then, as far as I'm concerned. In fact that is why I (re) raised the question about checking out the seat belts in post #75. Something different with the seat belts have not been eliminated yet. Okay looking at the old thread from 2009, 344870M posted his broadcast card and it has the Z in the SPCL box for the trim. Which should be special order or something different than the norm. Hate to beat it into the ground, but notice in the card above how the Z spcl box has a header over it for "Trim", and the corners of it taper down to indicate - at least to me - that the card indicates these things are grouped together. Was there something special for any interior trim that Canadian cars have different than the U.S. version? I agree with the logic that it has to be related to the trim in some way. Several errant letters have appeared on GM cars' cowl tags of all types throughout those years but almost always stand alone on the bottom line and/or spaced away from any corresponding code. The fact that the 'Z' stamp preceeds the trim code (on the tag and broadcast card) HAS to mean it is trim related and may be nothing more than, as Kurt suggested, something extraneous like a specific material requirement, etc. All interesting replies. I too believe it has something to do with the interior and of the export to Canada. Here's the kicker... The 1969 documents on RPO codes have no mention of Z49 as an option. However they do mention various options that I listed above at 11:54 this am. Also related to my post is where (442much) Ken mentioned Canadian Motor Vehicle Safety Standards. As an answer to America's National Traffic and Motor Safety Act that was passed by Congress in 1966, Canada passed the Canadian Motor Vehicle Safety Standards in 1969. And shortly thereafter known as the Canadian Motor Safety Act passed in 1971. My cars..........I only included the cars built for the model years 70,71, and 72. Last edited by 72xw30; January 15th, 2014 at 01:56 PM. I am also in agreement that the Z has to do with some type of different trim for Canada bound vehicles. Scot's previous thread that the Canadian Motor Safety Act passed in 1971 looks to confirm that the change from Z to Z49 code may in fact happened in 1971 for the factory to be in compliance with the new regulations. Note that the Buick guys are raising the same Z question. The new Canadian Act also probably included all GM models & Ford, Mopar, etc. We need more build codes to confirm this theory, lols. Here is the trim tag from my buddies 71. NO Z on the cowl tag or the Canadian paperwork. The car was built in the first week of Sept 1970. Sam, does your buddy have the original window sticker to see where this car delivered to (dealer wise). Not to discount the proof, but this could have been a dealer swap U.S. to Canada? Sorry, no original window sticker, just the Canadian paperwork. I have been digging through their posts because they are our nearest sibling, location wise and market segment wise to see if they had anything on this Z code! To add to the mix, I have a 70 Cutlass 4 door sedan built January 12, 1970(01B). It has the Z on the broadcast card and on the Fisher tag. Never was this car, nor was it intended to be, in Canada. The original owner ordered it in Illinois. The trim is Z922. Sherwood Green bench seat column shift automatic. AC and rear defrost. Oddly enough the only option shown on the card is C60 and there are no option codes on the Fisher Body tag. The outside of the car is Reef Turquoise main and black painted top. Pat it would seem that if Flint, Mich. and Lansing, Mich. had it, then wouldn't the GM products of the time have it as well in Detroit, Mich.? I have been watching this and others on the Z code and have a thought. That possibly the Z meant that it was "An Ordered Car" and not a "For Stock" car. That's my 2 cents. Just a thought. Scot, you maybe correct, but it will take some hard digging through other forums. So if anyone has the time! I am currently digging into the arrowhead side as we speak. The reasoning for tri-shield side is that they are mirror image (Insert your rage here) of Oldsmobile. Home town with a main plant, fisher body and H.Q. I might have to throw a e-mail at the GM heritage center and see if the have any input on this Z trim code. I know some Lansing Fisher body people but they hired in just after colonade series started. And they may know some fisher people to contact with some knowledge? Last edited by 1970cs; January 16th, 2014 at 04:17 PM. 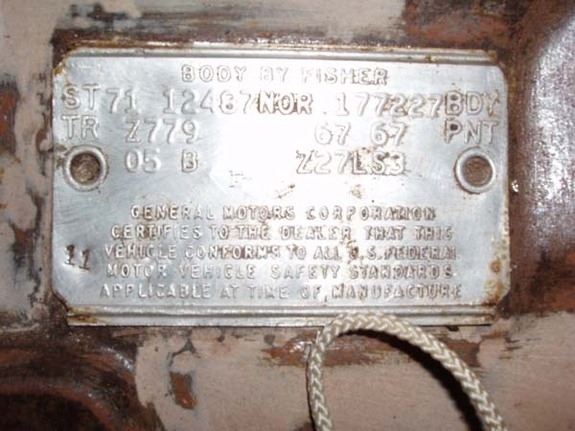 Got one from the Pontiac side, A 71 Tempest Z292 trim code on cowl tag May 72 build date. I am going to e-mail the heritage center to see if they can shed some light? Given the fact that the box where the Z is located, reads SPCL,could this refer to Special order or customer order as opposed to ordered for inventory. In the case of Sams 70 W30 Burnished Gold ,as an owner of this car before Sam, the paperwork showed it had been special ordered by the first owner. Tom Jensen Bamboo 70W30 was a customer order car. Other manufactures had codes for "sold car, customer waiting" built into data tags and shipping orders. A W30 was always a low volume seller as was a W31. 1 would guess most were customer order and not sales bank. I have owned 7 W30's from a 66, to 72 and all were customer ordered cars. The extensive research I have done on 71 W30cars over 25 years indicates a high % of ordered cars. This would explain the Z on some other cars, as they were likely customer ordered, convertibles and different color combinations. I will bet there were not al lot of 4 door and 2 Dr hardtop cars that were special ordered. I understand what you are saying, Paul, but I don't agree that Oldsmobile (at least) had anything on the cars or in the factory production documents to identify a customer ordered car. Especially not the Z on the cowl tag. There would be no reason for a customer ordered car have a cowl tag id (that I can think of). 3. To be sent to another dealer to replace a car they bought from the other dealer's inventory. The to the assembly line, there would be no reason to differentiate. Also, on the broadcast card, the Z is specifically under the trim heading only. Again, not consistent with being a customer ordered car. Last edited by wmachine; January 18th, 2014 at 03:33 PM. Very interesting Paul......you have me thinking on this and I agree so far........the paperwork on my W31 that also has a Z, shows it was "special" customer ordered and not ordered for inventory. I also know this as I am in contact with the original owners. Anyone else have paperwork on their Z cars that shows ordering information? Customer ordered? Or. Inventory ordered? Paul could be on to something here. Last edited by 72xw30; January 19th, 2014 at 06:36 AM. Since its on Fisher Body Tag, could it have something to do with the trim holes for around vinyl top? Vinyl tops was already optioned as C08 and the trim was the same for vinyl of 2 tones. There were enough cars ordered with vinyl roofs that I doubt that is the factor. Good thought but I border on the side of no! Mine is a 70 Lansing with vinyl roof no Z on cowl tag. And special order car? According to my window sticker I believe that my car was ordered! The window sticker dictates a somewhat odd deviation in the Supreme for the LC 350 2BBl. Cowl tag states 06B June 2nd week, 1970 June calender shows Sunday being the 7th the first day of second week. My POP shows retailed to customer 6-18-70. That's eleven total days from commencement of Fisher build then being trucked over to the main plant for final assembly then sitting on the holding lot to be either be trucked or trained to the dealer in Indianapolis then prepped for delivery. I see Mike (slantflat) 70 cutlass sedan having a Z code, for sure not a recommended interior color to exterior color combo. But we have Z cars that have seemed to be recommended color combos! So far we have debunked every theory so far. I did e-mail the heritage center on Friday in the A.M. No reply as of 5 P.M. Friday. I'd say it has something to do with the number it precedes. Maybe something to do with the color. Whatever Z is for on my car, it has to be green. Whatever it's for on a car with red interior, it has to be red. If it were for something not pertaining to the interior, it wouldn't be grouped with the interior code, it would be somewhere else. Just a thought. Another thought, my Z code has the map light in rear view mirror, did FB install wire? The Z having to do with Canadian requirements, possibly "Mandatory Canadian Base Equipment Modifications" has not been debunked yet as far as I'm concerned. It's debunked as far as I can see. Just looking at my car, it was special ordered from Oak Lawn, IL; these people lived in Crete, IL. It stayed in Crete until given to family in Park Forest, IL. So there is one car with the Z that has absolutely nothing to do with Canada. I did see what you posted. You'll have to explain what you mean by "special order". Bottom line is that just because the car was sold new in the US does *not* preclude that it was not possibly produced "to some Canadian standards". In other words, if the Z did indeed mean "Mandatory Canadian Base Equipment Modifications", that does not mean that the car could not have been sold new in the US. This was previously mentioned. I would think we would see MANY more Z cars in Canada and less than we do in the US. Yes, if the Z is Canada related, I presume you mean. And so far that seems to be the case, but there is not nearly enough feedback yet in that respect. It may just be a coincidence that most of the Z cars initially brought up have been Canadian sold. The people that bought my car new went to the Oldsmobile dealer and checked off boxes on an order form for the car that they wanted. I'm guessing it would have been some time in December of 69 since the car was built January 12, 1970. I'd have to say they ordered the car pretty much for what it would look like, since it was like many other Cutlass sedans. Two barrel 350, automatic, pegleg 256 rear. I was thinking maybe the Z was a check digit for the non-recommended combinations. So that when someone ordered an orange car with a green interior no line worker would say, who the hell would order something like that. The check digit would indicate that indeed it was supposed to be like that and not a mistake somewhere. But if we have cars that have a recommended combo that doesn't hold water, either. My 1970 W-31 with black interior & Z beside 949 on the cowl tag disproves this theory. Black was approved with all exterior colors. A friend of mine is currently restoring a 70 W30 here in Ontario. It was delivered to a dealer in Canada and it has the Z on the cowl tag. No Z on the Canadian GM paperwork. He does not have a broadcast card for the vehicle but I'm sure that the broadcast card would have the Z too if it was found. Last edited by 72xw30; January 20th, 2014 at 11:40 AM. Trust me, I'm not trying to be argumentative. But there are some fine line details here. First, ordering a car like that is ordering a car. There is apparently nothing "special ordered" about it. Second, customers were not the ones who checked off the boxes, the Salesman (or other Dealer employee) did. Do you have any of the paperwork showing what was ordered? Just trying to establish what is documented vs what was was said. And regardless, what happened after the car was ordered? Do you know what the dealer did? Can you be certain that he did not find this car somewhere to fill the order? This is why the more paperwork there is, the more there is that is actually known about what happened. Again, I'm not out to argue about this, but rather show how something that can *appear* to be something may not be. This is what research is all about. It was included with the convenience group Y60 as part of that specific harness/connectors That would likely have been installed at Fisher as part of the body build/trim/wiring. No, man, you're right, I don't know for sure what happened when the couple ordered the car. I have minimal paperwork, and nothing that would show definitively whether or not the car was destined for Canada and rerouted or not. My opinion is that the Z doesn't have anything to do with Canada, and that's based solely on my car alone. If it turns out it does mean Canada that's great. If it turns out it means the crank turns backwards when you open the vent window, that's okay too. Window cranks are all the same, rear ashtrays are installed differently in Canadian Cars. While we are on the subject of Build cards, anyone ever seen a code in the V78 box, ore the AC'T or the PP, which seems to always have a 2. Of all the cars in question here does anyone have larger format broadcast sheet for a 70 with the Z code. Are you thinking buildsheet? Were talking Lansing cars which buildsheets are not present in them!